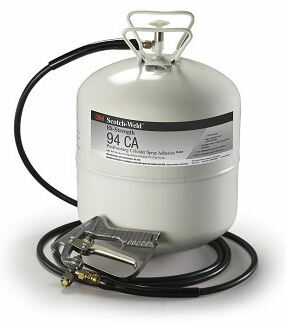 3M(TM) Scotch-Weld(TM) Hi-Strength Postforming 94 CA Cylinder Spray Adhesive is a low VOC, high performance, postformable grade spray adhesive with a unique low telegraphing pebble spray pattern. 3M Scotch-Weld Hi-Strength Postforming 94 CA Cylinder Spray Adhesive bonds to a variety of demanding substrates like decorative lamiante, metal, and some rubbers. Typically used in woodworking and specialty vehicle applications, especially where VOC`s are a concern. It is specifically designed for decorative laminate bonding and is SCAQMD Rule 1168 and LEED compliant. Packaged in pre-pressurized canister for an easy to use, maintenance free delivery system. Cylinder Applicator and hose sold seperately.